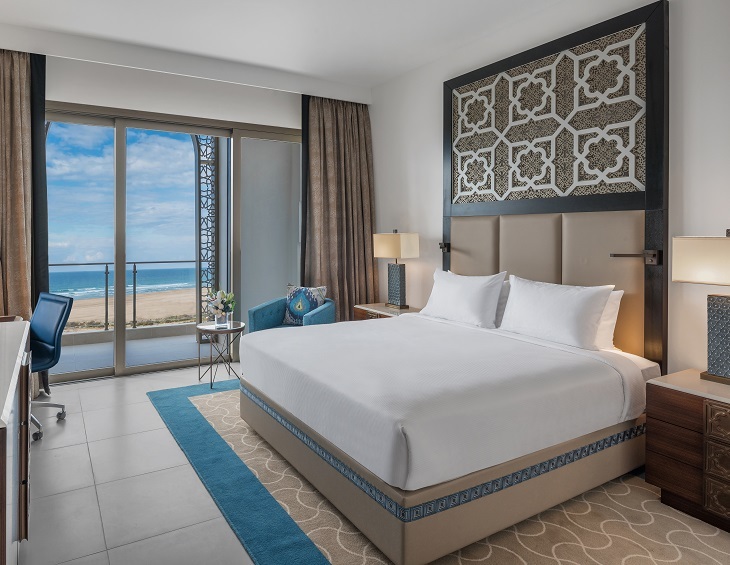 Set on a pristine beach, Hilton Tangier Al Houara Resort & Spa has opened, marking the group’s third property in Morocco. With its upscale accommodations, beachfront location and extensive range of leisure facilities, the resort is an oasis for relaxation and rejuvenation. The 304-key Hilton Tangier Al Houara Resort & Spa is located within a protected national park, offering direct access to five kilometers of idyllic white sandy beach. Tangier, a cosmopolitan port-city on the Strait of Gibraltar is the embodiment of culture with its UNESCO sights and nearby attractions, such as The Kasbah. Famous for its year-round pleasant weather and beautiful beaches, the city is seeing increasing numbers of visitors every year. Spread across an impressive 850m², the hotel’s eforea spa is equipped with state of the art treatment rooms, a beauty salon, hairdresser, jacuzzi, sauna, steam room and a 24/7 gym. For those looking to perfect their swing during their stay, the hotel offers two spectacular golf courses alongside a Golf Academy. In addition, The hotel boasts 4,500m² of flexible event space with capacity for up to 1,400 guests. The hotel offers 15 flexible meeting rooms as well as two pillarless ballrooms. With an expansive foyer that leads to an outdoor terrace, the space is ideal for hosting coffee breaks, cocktail receptions and buffets. Meanwhile, the culinary experience is said to be at the heart of the hotel with the hotel boasting a total of five restaurants and bars. Boasting 304 exquisite guestrooms and suites, including 50 apartments, all guestrooms feature a blend of Moroccan and international design touches with private balconies overlooking either the Atlantic Ocean or 11 hectares of garden. With more than 585 hotels across six continents, Hilton Hotels & Resorts properties are located in the world’s most sought-after destinations for guests who know that where they stay matters. This particular opening marks a significant growth in North Africa.